When it rains in the Eastern Coachella town of Thermal, it can get so muddy that cars often get stuck on the unpaved roads running parallel to the lettuce fields. That makes it hard for farmworkers to get to their homes at Camp Fremont, a tiny trailer park at the end of a long dirt road. It’s a cluster of mobile homes, some with plywood covering holes in the walls, far from streetlights, supermarkets, and cell phone service. “We can’t even connect to the internet,” says 25-year old Olivia Rodriguez, who graduated from UC Berkeley and lives in a two-bedroom trailer with her parents, her sister, and her sister’s two young children. “For you to be on the internet or on your phone very much you really have to go and drive somewhere,” explains Rodriguez. Challenging as that may sound, Rodriguez chose to return home after completing her studies at UC Berkeley. 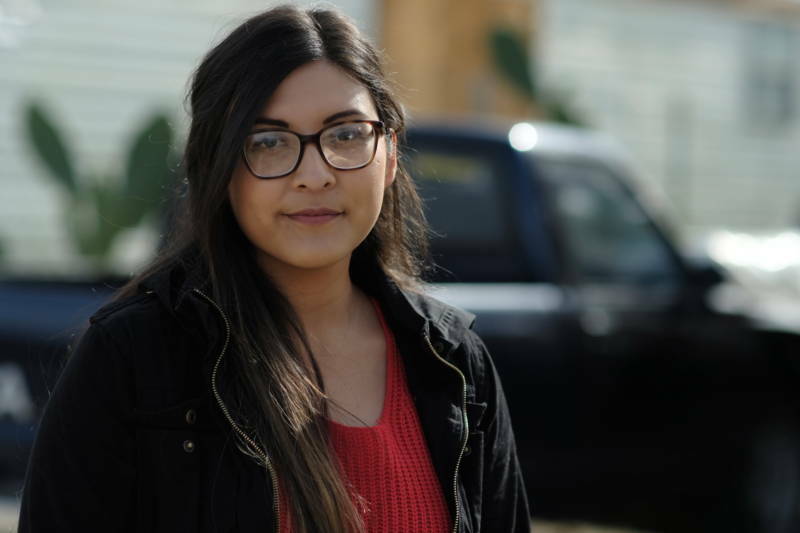 She wants to use her education as a springboard to transform conditions for people like her family members, their neighbors, and farmworkers in her part of the region. “We're lacking a lot of things, but it's such a beautiful place just because of the people that are here and our surroundings,” she says. She loves how bright the stars are here. “There’s no nights anywhere for me in the world like the nights that we have here in the Eastern Coachella Valley,” she adds. She loves the sounds of the roosters in the morning and the coyotes at night. But lately, there’s been a different kind of sound piercing the quiet out here. Rodriguez takes me down the dirt road a bit to see a racetrack for luxury cars, part of an ultra-exclusive resort adjacent to a private airport. It boasts 15-thousand-square-foot weekend homes for car collectors — just across a lettuce field from Rodriguez’s trailer park. It’s really aggravating, she says, that the only paved roads with street lights near her home have been built for this racetrack. In high school, she says, teachers told her, “You need to move out of here. That’s the American dream.” At one point she believed it: that the only way to be successful was to move away from this valley. Her dad, Vicente, was a high school math teacher in Mexico. His wife was a skilled technical artist. They came here to find jobs, but ended up working in the fields. "We started working in the vines, in the grapes," he says. "Sometimes I regretted it. I would tell myself, 'I could be giving classes behind a desk right now.'" But then the Rodriguez’s twin girls, Olivia and Maria, came along. Vicente tears up as he tells the story in Spanish. “I definitely couldn’t leave once they were born,” he says, sniffling. “Sorry, I get kind of emotional. I’m kind of a crybaby. But these are happy tears. Here, my kids can get an education." Vicente tutored both his girls in math, and pushed them to succeed. One memorable day, when Rodriguez was a high school senior, Vicente went to the post office to pick up the family’s mail, then stopped at a house where he was laying tile as a side job. The man who lived there noticed a big envelope in Vicente’s hand. “He told me, that envelope is from UC Berkeley. Berkeley only accepts a few students, only the best.'" That was how he found out his daughter applied to Berkeley and had gotten into an elite school. He had no context for it. Berkeley was tough for Rodriguez. It was a culture shock to live in a city where her dorm cost far more than many of her farmworker neighbors earned in a year. A place where she could take a bus or a train, instead of walking along muddy roads to try to catch a ride to school. She was going to school with kids whose parents got them lofty summer internships, while she worked vacations in the fields. But her classes at Berkeley taught her something else: she could do more to challenge the poverty and inequity in the Eastern Coachella Valley by coming back. Rodriguez now has a biology degree under her belt, and a master’s in public health in the works. 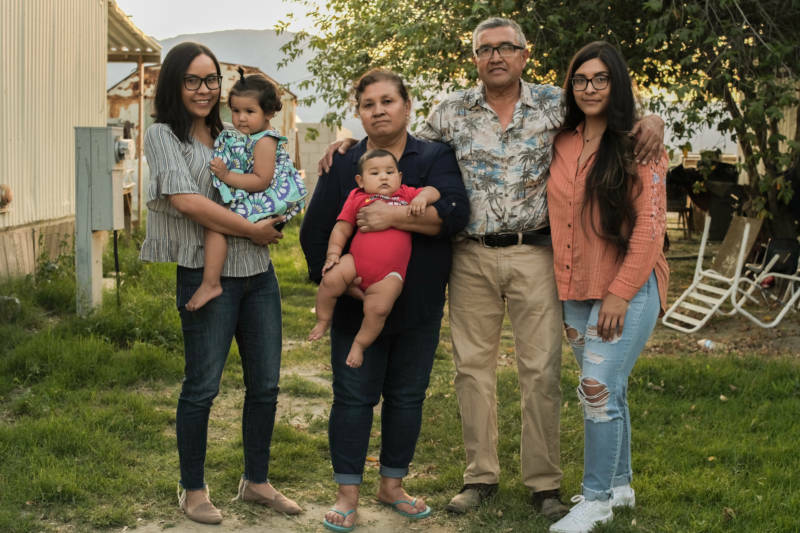 After years of translating for her parents at the doctor's office, Rodriguez wants to help change the way farmworkers are treated by the medical system when they seek attention for chronic problems like diabetes or heart disease. Sometimes, she says, they’re just flatly told to eat fewer tortillas. 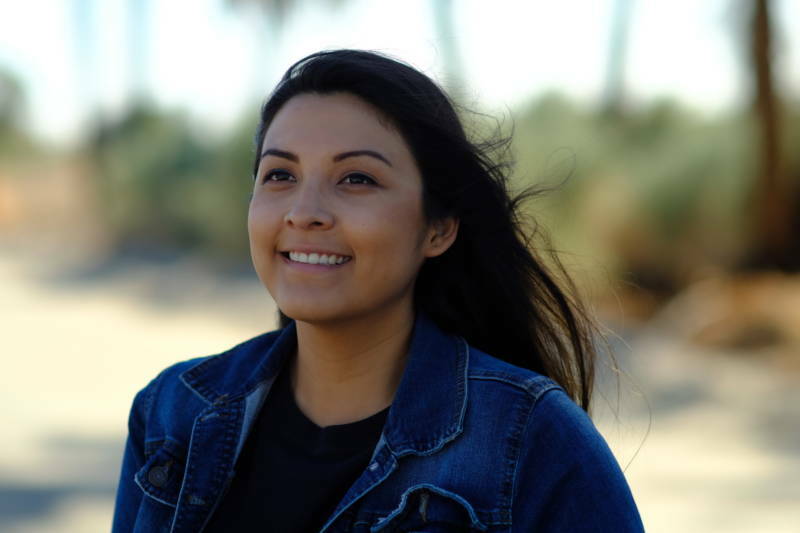 Rodriguez is also a journalist with Coachella Unincorporated, a media outlet that elevates the voices of young people in the Eastern Coachella Valley. She co-produced “Estamos Aqui/We are Here” - a new documentary looking at the environmental and health impacts of the Salton Sea. She wants people watching it to know that there is much more to this place than just a high-profile music festival. It frustrates her that when she wears her Coachella Unincorporated T-shirt out of town, she gets some annoying questions.